Prime Minister Narendra Modi today took potshots at the Congress for making 'gas cylinders' their poll plank during the 2014 polls and said the party's vision was limited to cylinders. MANILA: Prime Minister Narendra Modi today took potshots at the Congress for making 'gas cylinders' their poll plank during the 2014 polls and said the party's vision was limited to cylinders but his government allotted free LPG connections to three crore families since coming to power. Addressing the Indian community in the Philippines capital during his maiden visit, Modi said there was a time when families would celebrate getting gas connections as if they have got home a Mercedes. "Members of Parliament used to get coupons for 25 LPG gas connections annually to oblige people of their constituency...Imagine, gas connections!" he said. Recalling the 2014 Lok Sabha elections, Modi said BJP made him the prime ministerial candidate and people were waiting for the Congress to decide on its candidate. "The Congress party held a meeting and later told a press conference that they have decided that if they retain power they will increase the number of LPG gas cylinders to consumers from nine to 12 per year," he said. "That (number of cylinders) was going to be their poll issue. That was the expanse of their thought and even the people would be amused by such announcements...Such narrow vision at times leads to major crisis," he said, referring to the Congress-led UPA's ouster from power after a decade. 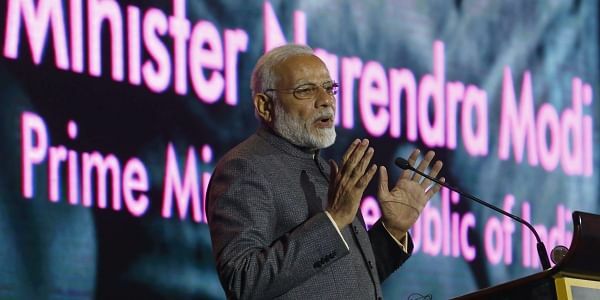 Modi said that during his speech from the ramparts of the Red Fort he had requested the well-off citizens to give up LPG subsidy which led 1.5 crore consumers giving up the benefits that were passed on to the poor in form of free connections. "There are 25 crore families in the country. Three crore families have been given gas connections and our target is to provide it to five crore families," he said, highlighting the harms of fuel-wood on women and children. "When my party came to power, we linked LPG connections with Aadhaar. It was revealed that earlier subsidies were also given to people who did not even exist! Subsidy should be given to deserving people. We are saving Rs 57,000 crore annually by linking LPG connections with Aadhaar," he said. Modi said the people who earlier wrongly benefited will always opposing him and vowed that he will leave no stone unturned in fulfilling the mission for which he was elected. He also took a jibe at the UPA government referring to its scam-mired tenure, saying that before 2014 people would ask how much money lost due to corruption but now they ask how much money has come back. Addressing a hall full of Indian community members, Modi also talked about his other initiatives -- the Jan Dhan Yojna and the Swachh Bharat. He said 30 crore families, which were out of the banking system for 70 years, have got their zero minimum balance accounts during the NDA regime and their total savings amounted to Rs 67,000 crore. "This is not a small change. Those (the poor) who were out of the banking system have now become the focal point of it," he remarked. "If Singapore can be clean, if Philippines can be clean then why not India?" he said amid applause from the audience. "Which Indian doesn't want cleanliness? We have started from where Mahatma Gandhi left and till now over 2.25 lakh villages in India have become open defecation free," he said.